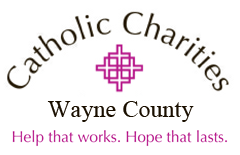 Catholic Charities Wayne County | Help that works. Hope that lasts. We Gladly Serve ALL People! The mission of Catholic Charities of Wayne County is to assist individuals and families in meeting their basic needs, to empower and promote their self-sufficiency, and to advocate for social justice, in fulfillment of the Diocese of Rochester’s commitment to build a just and compassionate society rooted in the dignity of ALL people.